The North Channel Chamber of Commerce continued a busy schedule last Friday, with their monthly luncheon. This followed a very successful, well attended 40th Anniversary Gala the week before. 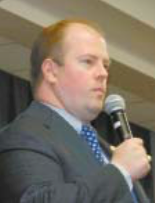 Adam Lund, the new president of the Chamber, emceed the luncheon meeting, which started with Mark Kramer of Channelview ISD presenting Outstanding Students and Educators. New members were also introduced, including Huckabee Architects, and Andrew Held of Frost Bank. This was followed by the keynote speaker, Harris County District Clerk Chris Daniel, who managed to give a talk that was both entertaining, informative, and full of historical anecdotes. Daniel’s District Clerk office is in charge of court records, he said. As such, he is in charge of jury duty for county courts, and also offers passport services and maintains historical Harris County Court Records dating back to 1836. In regard to jury duty, Daniel said that you may be called to serve on a jury if you are registered to vote, or if you have a drivers license. The drivers license list was added, after the state discovered that some were not registering to vote to avoid jury duty. Daniel also maintains a website where the public can search and read all court records. This is at www.hcdistrictclerk.com. There is also a tab on the site for obtaining free background checks on other individuals. 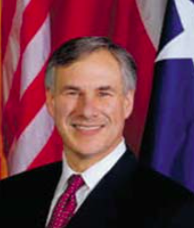 AUSTIN – Coinciding with his State of the State address, Governor Greg Abbott today released his budget for the 2018-19 biennium. The Governor’s budget ensures Texas will live within its means while fully funding key priorities without raising taxes or debt, and without looting the Rainy Day Fund. The budget released by the Governor builds on the successes of the 84th Legislature and looks to the future by strategically investing in priorities that protect the safety and security of Texans, furthers educational advancement of our future workforce, and empowers the private sector to create jobs, while also defending individual liberties and guarding against government overreach. MARK COYLE of Crosby Dredging and Construction explains with a slide show the regulations and details of dredging and water depth in the Houston Ship Channel. 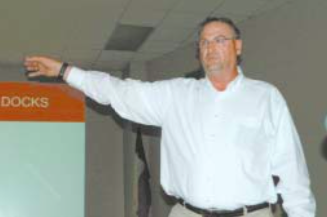 Members and guests of the CIP (Community-Industry Partnership) heard details of dredging methods and regulations, at their last meeting on Thursday, Feb. 2 at the Baggett Center in Galena Park. Mark Coyle explained that there are four types of dredging: Hydraulic, Mechanical, Mechanical/Hydraulic Offloading, and Hopper. The choice of which type is governed by cost, and conditions and location of the required work. Also a consideration is where the dredged material will be disposed of. Coyle said that the Army Corps of Engineers counts 12 approved disposal areas around the ship channel, including three in the Galena Park area. Coyle said that sometimes these spoils areas can sometimes be turned into “beneficial use sites” suitable for marsh or wildlife areas. At their weekly luncheon last week, the North Shore Rotarians were updated on several community projects that they support. 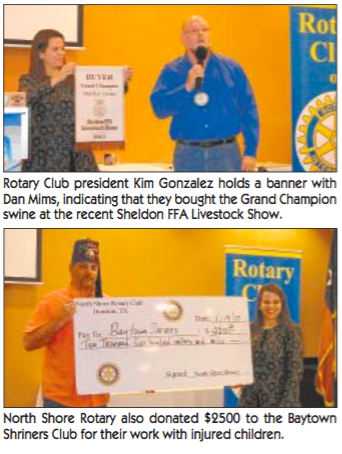 Rotarian Dan Mims and club president Kim Gonzalez displayed a banner from the Sheldon FFA Livestock Show, indicating that the club had purchased a Grand Champion swine in support of the scholarship program. The pig was exhibited by Kaydee Denton, and purchased for $1600. The club also purchased other animals at the Show, including the 3rd place swine exhibited by Samantha Doerr and purchased for $1250, and the 5th place swine, exhibited by Alfonso Trevino and purchased for $1200. In addition, other Rotarians Dan Mims, and Don Nino bought animals on their own.